Department of Pharmaceutics, Bharati Vidyapeeth College of Pharmacy, Near Chitranagari, Kolhapur -416013, Maharashtra, India. ABSTRACT: The present investigation was to formulation and development of fast dissolving mucoadhesive buccal film of nebivolol by using solvent casting method. Nebivolol is a third-generation cardio selective β1-blocker undergoes extensive metabolism in the liver, gastrointestinal disturbance, abdominal pain after its oral administration and resulting in to a poor (10-12%) bioavailability. In order to improve the bioavailability, efficacy and to minimize the side effects associated with oral administration. 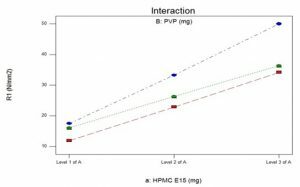 Prepared mucoadhesive buccal films using HPMC E15 and PVP as mucoadhesive polymers. 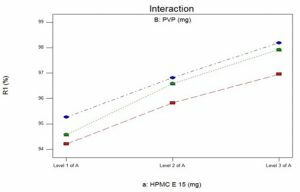 Among the two polymers used HPMC E15 showed an increased in-vitro residence time due to high mucoadhesive property. Mucoadhesive buccal films were evaluated by weight variation, thickness, folding endurance, pH, in-vitro disintegration, in vitro dissolution, tensile strength and drug content. In-vitro drug release study showed that more than 98.19 ± 0.02 % drug was released within 40 min. The tensile strength of formulation SW9 was found 50.00 N/mm2. Folding endurance of formulation SW9 was found 149. The disintegration time for formulation SW1 was found to be 79.37 seconds and SW9 was 70.03 seconds respectively. Thus it can be concluded that the prepared formulation of buccal mucoadhesive film can be a novel treatment for myocardial infarction and angina pectoris. INTRODUCTION: The buccal mucosa, along with other mucosal tissues, has been investigated as a potential site for controlled delivery of macromolecular therapeutic agents, such as peptides, proteins and polysaccharides because of its accessibility and low enzymatic activity compared to the gastro-intestinal tract 1 - 3. The potential of the buccal mucosa as an alternative site for the delivery of drugs into the systemic circulation has recently received much attention. There are various reasons, why the buccal mucosa might be an attractive site for the delivery of therapeutic agents into the systemic circulation 4 - 6. Due to the direct drainage of blood from the buccal epithelium into the internal jugular vein, the first-pass metabolism in the liver and intestine may be avoided. This first-pass effect is a major reason for the poor bioavailability of some compounds, when administered orally. Additionally, the mucosal lining the oral cavity is easily accessible, which ensures that a dosage form can be applied to the required site and removed easily in case of emergency. The film is an ideal intraoral fast-dissolving drug delivery system, which satisfies the unmet needs of the market, is easy to handle and administration, maintains a simple and convenient packaging, alleviates unpleasant taste, and is easy to manufacture. The film is placed on the top or the floor of the tongue 7, 8. It is retained at the site of application and rapidly releases the drug for local and systemic absorption 9. Oral fast dissolving film is one such novel approach to increase consumer acceptance by virtue rapid dissolution, self administration without using water or chewing. However, the fear of taking solid tablets and the risk of choking for certain patient populations still exist despite their short disintegration/dissolution times. The film overcome the danger/fear of choking10. The development of a fast-dissolving film also provides an opportunity for a line extension in the market place; a wide range of drugs (e.g., neuroleptics, cardiovascular drugs, analgesics, antihistamines, antiasthmatic and drugs for erectile dysfunction) can be considered suitable candidates for this drug delivery 11. Drug delivery via the oral mucosa is a promising route, to achieve a rapid onset of action or improved bioavailability for drugs with high first-pass metabolism 12. Thus, there is a growing interest in developing alternative dosage forms, i.e. orally fast disintegrating strip, which allow a rapidly dissolving drug to absorb directly into the systemic circulation through the oral mucosa 13. These kinds of dosage forms are also convenient for children, elderly patients with swallowing difficulties, and in the absence of potable liquids. However, in addition to formulation considerations, the properties of the active compound have to be appropriate in order to achieve drug delivery into systemic circulation after intraoral administration. Nebivolol is a third-generation β1selective blocker used in the treatment of hypertension, it works by relaxing blood vessels and slowing heart rate to improve blood flow and decrease blood pressure. Nebivolol on oral administration undergoes extensive metabolism in the liver resulting into very poor (10-12%) bioavailability 14, 15. It can also cause gastrointestinal disturbance and abdominal or stomach pain etc.16 In order to improve its bioavailability, efficacy and to minimize the side effects associated with oral administration, mucoadhesive buccal films of nebivolol using hydroxy propyl methyl cellulose and polyvinyl alcohol were prepared by solvent casting method in the present investigation. Material: Nebivolol hydrochloride drug was procured from East West Pharmaceuticals Pvt. Ltd. Haridwar, Uttrakhand. HPMC E15 was obtained as a gift sample from Colorcon Asia Pvt. Ltd. Goa. Polyvinyl pyrolidone and citric acid was purchased from Molychem Pvt. Ltd. Mumbai, Propylene glycol was purchased from Loba chemie Pvt. Ltd. Mumbai. Tween 80, Mannitol and peppermint oil was purchased from Merck specialities Pvt. Ltd. Mumbai. All other chemicals were of analytical grade. Preparation of Fast Dissolving Film by Solvent Casting Method: Nebivolol mucoadhesive buccal films were prepared by using hydroxyl propyl methyl cellulose (HPMC) and PVP by solvent casting technique 17 - 19. Water soluble polymers like HPMC E15 and PVP were dissolved in hot water up to 40 ºC to form a homogenous viscous mixture with simultaneous stirring at 1000 rpm. Cool this viscous solution to room temperature. This was followed by addition of API (Nebivolol hydrochloride), plasticizer (propylene glycol) and other ingredients like mannitol, citric acid and flavour (peppermint oil) were also mixed and sonicated for 15 minutes untill the drug was completely dissolved. Final film solution casting on a standard petridish for defoaming. It is dried in hot air oven at 40 ºC for 3 h. The film was carefully removed from the petridish, checked for any imperfections and cut into the required size to deliver the equivalent dose (2x2 cm2) per strip 20, 21. The samples were stored in desiccators at relative humidity 30-35 % until further analysis. Formulation of mucoadhesive fast dissolving buccal film shown in Table 1. Experimental Design: A 32 factorial design was used 2 factors were evaluated, each at 3 levels, experimental batches were performed at all 9 possible combinations. 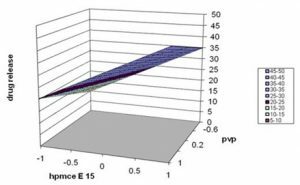 The amount of HPMC E15 (X1) and PVP (X2) were selected as independent variables, whereas tensile strength, cumulative % drug release were selected as dependent variables 22, 23. The data were subjected to 3-D response surface methodology in PCP Disso 2.08 to determine the effect of types and amount of polymers on the various dependent variables. Full factorial experimental design layout was shown in Table 3. The values of variables in a 32 factorial design were indicated in Table 2. Peppermint oil q.s. q.s. q.s q.s. q.s. q.s. q.s. q.s. q.s. A statistical model incorporating interactive and polynomial terms was used to calculate the responses. Where, in equation (1), Y is the dependent variable,b0 is the arithmetic mean response of the 9 trials, and bi (b1,b2,b12,b11 and b22) is the estimated coefficient for the corresponding factor Xi (X1, X2, X1X2, X12 and X22, which represents the average result of changing one factor at a time from its low to high value. The interaction term (X1X2) shows how the response changes when 2 factors are simultaneously changed. The polynomial terms (X1X1 and X2X2) are included to investigate the nonlinearity and є indicates random error. individually average weights were calculated. The thickness of film determined by, three films of each formulation were measured using vernier caliper (Mitutoyo, Japan) at three different places, and the mean value calculated 24. Folding endurance were determined, three films of each formulation of required size are cut by using sharp blade. Folding endurance was to be determined by repeatedly folding the film (2×2cm2) at the same place, till it was broken. The number of times, the film could be folded at the same place without breaking gives the value of folding endurance 25. The surface pH of film was determined by, dissolving one oral film in 10 ml distilled water and measuring the pH of the obtained solution 26. Tensile strength test for mucoadhesive films was performed by using tensile strength apparatus. The strip of the patch (2×2 cm2) was cut and holded between these two clamps. Weight was gradually increased on the pan, so as to increase the pulling force till the patch broke. The force required to break the film was consider as a tensile strength and it was calculated as N/mm2. Drug content uniformity of film determined by, five film strips (2×2 cm2) were cut from the four corners and the central part of the molded film. Each film strip was placed in separate conical flask containing 100 ml of distilled water. The flasks were shaken in mechanical shaker for 2 hr. All the solutions were filtered and analyzed at 282 nm by using UV-Visible spectrophotometer. In-vitro disintegration test was performed by USP disintegration apparatus (Veego instrument corporation, Mumbai). Film sample (2×2 cm2) of each batch was placed in 25 ml of simulated saliva. The disintegration time is the time when a film starts to break or disintegrate. In-vitro Dissolution Studies: The dissolution study was carried out using USP dissolution test apparatus II (paddle apparatus), 500 ml simulated saliva (pH 6.8) kept at 37 ± 0.5 ºC and stirred at 50 rpm. Film was cut into patch of (2×2 cm2) size and immersed in vessel containing dissolution medium. 5 ml samples were withdrawn at 5, 10, 15, 20 and 40 min. time interval and filtered and analyzed by UV- visible spectrophotometrically at 282 nm. 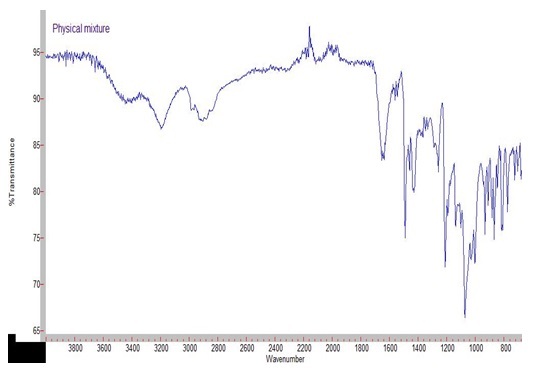 Fourier Transform Infrared Spectroscopy (FTIR): Infrared spectrum of nebivolol hydrochloride was determined by using Fourier Transform Infrared Spectrophotometer (FTIR-4100, Shimadzu), KBr dispersion method. Infrared spectrums of pure drug and optimized batches were recorded. From the overlay spectrum analysis the compatibility of ingredients in the formulations was found out. Pure, completely dried KBr was used as blank and before running the sample. Differential Scanning Calorimetry (DSC): Thermograms of physical mixture and optimized formulation were obtained using DSC (Pyris Diamond TG/DTA, Make-Perkin Elmer) equipped with an intracooler. Platinum crucible used with alpha alumina powder as reference to calibrate the DSC temperature and enthalpy scale. The powder samples of 2-10 mg were hermetically kept in the aluminium pan and heated at constant rate per 10 °C. Stability Studies: For stability study, optimized formulation was kept for 30-90 days in stability chamber and samples were taken after 30 days and 90 days and analyzed for tensile Strength, Drug content and % drug release study for a period of 90 days at 40 °C ± 5 °C and 75 % RH. 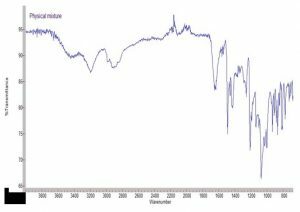 Fourier Transform Infrared Spectroscopy Study: FTIR studies revealed that the fundamental peaks of the nebivolol HCl are retained in physical mixture. Results showed that no any chemical interaction between nebivolol HCl and polymers used in the formulation hence; these can be used in the formulation of mucoadhesive fast dissolving film of nebivolol HCl. The FTIR spectrum of HPMC E 15 and PVP, Physical mixture are shown in Fig. 1. Fast dissolving mucoadhesive buccal film prepared by solvent casting method and characterized by various parameters. Physical Evaluation of Film: The weight of polymer increases the weight of the film also increases. Weight of the films of batches SW1- SW9 was found in the range 92.08 -113.23 mg. The weight of the film was found of the SW1 formulation which was 92.08 mg and 113.23 mg of SW9 formulation shown in Table 4. Thickness of film, as polymer concentration increases, the thickness of the film also increases. Film thickness of formulation SW1-SW9 was found in the range 0.18-0.26 mm. Thickness of formulation SW9 was found to be 0.26 mm. The low values for standard deviation indicate physical uniformity of the film. The folding endurance measures the ability of film to withstand rupture. The folding endurance was measured manually and it was found to be as polymer concentration increases the folding endurance of the film also increases. 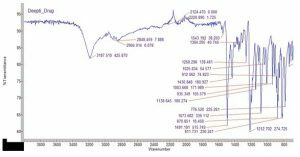 The folding endurance of the film was found between 139-149, the results obtained shown in Table 4. Folding endurance of formulation SW9 was found 149. The folding endurance values of the films were found to be optimum and therefore the films exhibited good physical and mechanical properties. The surface pH of the film was found in the range of 6.9-7.1 for all formulations, the results are shown in Table 4. Surface pH of formulation SW9 was found to be 7.0. The surface pH of all the films was within the range of salivary pH. No significant difference was found in surface pH of all formulations. The measured surface pH was found to be close to neutral in all the formulations, which means that they have less potential to irritate the buccal mucosa and therefore they should be fairly comfortable. Tensile Strength Study: The tensile strength of the film was found between 11.90-50.00 N/mm2. The tensile strength of formulation SW9 was found 50.00 N/mm2. The result of tensile strength test is shown in table 4 and response surface plot is shown in Fig. 2. 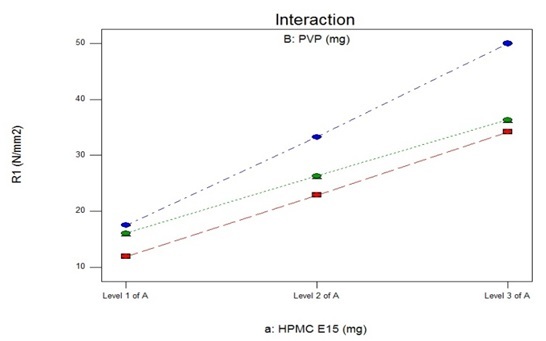 From the surface response plot, it is clearly indicates that there was increase in tensile strength with increase the amount of HPMC E15, this may be due to the hydrogen bonding in drug and polymer and also increase in tensile strength with increase in PVP in the polymer blend. There are two independent variables plotted against each other. 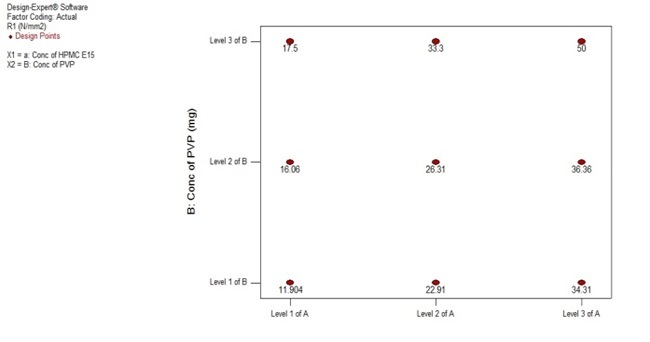 Contour plot of HPMC E 15 and PVP shows that the maximum concentration of HPMC E 15 and PVP increases the tensile strength. 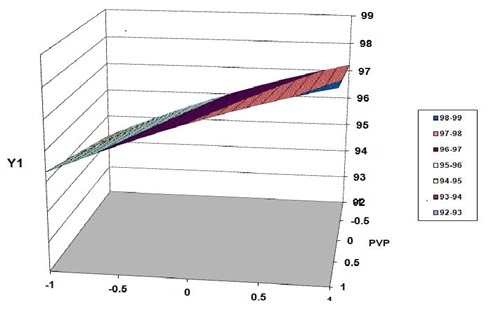 In an interaction plot of tensile strength shown in Fig. 3, there are dependent variables plotted against independent variables. There are three lines shown these lines represents there is non-significant interaction between HPMC E15 and PVP. It indicates that two independent variables show individual effect on tensile strength. Drug content of all batches were within the range between to be 96.60 to 99.25 %, which shown in Table 4. The drug content of formulation SW9 was found to be 99.86 %. It was much closer to 100 % means there is no any loss of drug during the preparation of the film. Disintegration time was found in the range of 70.03 to 79.37 seconds shown in Table 4. The disintegration time for formulation SW1 was found to be 79.37 seconds and SW9 was 70.03 seconds respectively. In-vitro Drug Release Studies: The % cumulative release of drug is shown in Table 5 and Fig. 4. HPMC E15 initially absorbs water and form gel. From the result obtained that % drug release for first 5 minutes was around approximately 50% (average of SW1-SW9). For formulation SW1-SW3, which contains 500 mg HPMC E15, the drug release in first 5 minutes was found increases from 47.06 % to 49.56 %. The same results obtained for the SW4-SW6 (contains 550 mg HPMC E 15) and SW7-SW9 (contains 600 mg HPMC E 15) with drug release 49.98 % to 50.87 % and 50.98 % to 52.98 %. For the complete release of drug, which was found within 40 min. 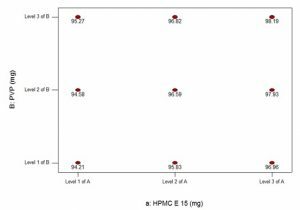 As these formulations contain increased concentration of HPMC E15 i.e. 500 mg, 550 mg and 600 mg for SW1, SW4 and SW7 respectively, drug release was increased. 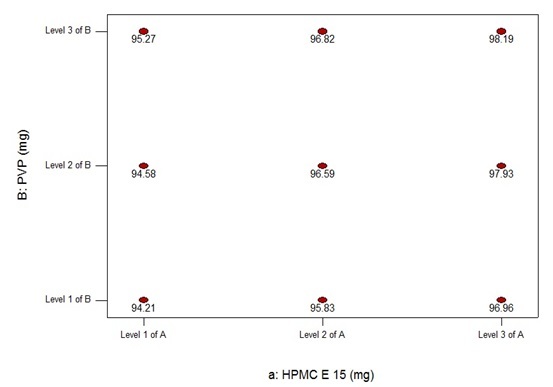 From the results obtained on comparison, as the concentration of HPMC E15 increases the percent drug release increases. Initially there was rapid release of drug from the film as shown in Fig. 4. This rapid drug release (burst effect) from mucoadhesive film might be due to rapid dissolution of the surface drug. It is well known that the addition of hydrophilic component to an insoluble film former leads to enhance its release rate. This may be due to dissolution of the aqueous soluble fraction of the film, which leads to creation of pores and decrease of mean diffusion path length of the drug molecule to be released. When matrix film comes into contact with a dissolution fluid, the fluid is absorbed into the polymer matrix and this initiates polymer chain dissolution process in the matrix. formulations. Hence, formulation SW9 was considered as the optimized formulation, regression coefficients of SW1-SW9 batches shown in Table 5. E 15 and PVP shows that the maximum concentration of HPMC E 15 and PVP increases the percent drug release. In an interaction plot of percent drug release shown in Fig. 6. There are three lines shown these lines represents there is non-significant interaction between HPMC E 15 and PVP. It indicates that two independent variables showing individual effect on percent drug release. Surface response plot of Tensile strength: The b0 = 25.74 which is the arithmetic mean of all nine trials batches. The positive X1 coefficient indicates that as the concentration of X1 increase there is increase in the tensile strength. The positive X2 coefficient indicates that as the concentration of X2 increase, the tensile strength increase. The negative X1X1 coefficient indicates that as the concentration of X1 when multiplied there is negative effect on tensile strength. The positive term X2X2 indicates when quantity of X2 multiplied there is positive effect on tensile strength, which is seen in the response surface plot. The positive X1X2 coefficient indicates positive effect on tensile strength, which is seen in the response surface plot Fig. 7. Surface Response Plot of % Drug Release: The b0 = 96.50 which is the arithmetic mean of all nine trials batches. The positive X1 coefficient indicates that as the concentration of X1 increase there is increase in the percent drug release. The positive X2 coefficient indicates that as the concentration of X2 increase, the percent drug release also increase. The negative X1X1 coefficient indicates that as the concentration of X1 when multiplied there is negative effect on percent drug release. The positive term X2X2 indicates when X2 multiplied positive effect on percent drug release, which is seen in the response surface plot. The positive X1X2 coefficient indicates positive effect on percent drug release, which is seen in the response surface plot Fig. 8. 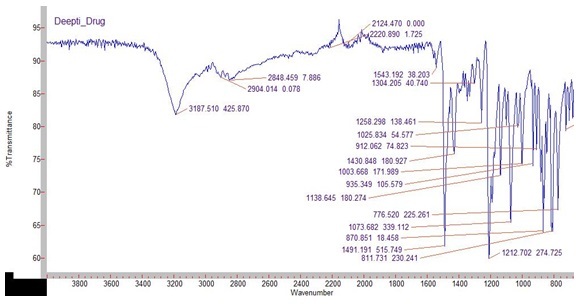 Fourier Transform Infrared Spectroscopy (FTIR): The spectrum of pure nebivolol HCl and optimized batch SW9 shows characteristic peaks at 1073 cm–1 (ether stretch); 3187 cm–1(N-H bend, secondary amines); 1212 cm–1 (C-F stretch, aryl fluoride); 1430 cm–1 (C=C stretch, aromatic group) and 3138 cm–1 (O-H stretch). Principle peaks were found in the range corresponding to functional group. Overlain spectrums of pure drug (Nebivolol HCl) and optimized batch SW9 were shown in Fig. 10. FTIR studies revealed that the fundamental peaks of the nebivolol HCl are retained in physical mixture. The results showed that no chemical interaction between nebivolol HCl and polymers used in the formulation, hence; it can be used in the formulation of fast dissolving film of nebivolol HCl. The spectrum shows all prominent peaks of nebivolol HCl. The FT-IR spectrum of nebivolol HCl is shown in Fig. 9. 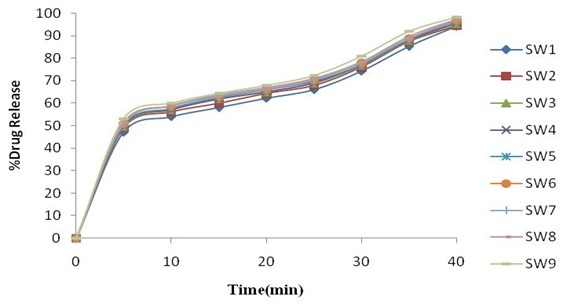 Differential Scanning Calorimetry (DSC): From DSC study it was concluded that, the pure drug nebivolol gives rise to a sharp endothermic peak that corresponds to melting at 228 ºC indicating its crystalline nature. 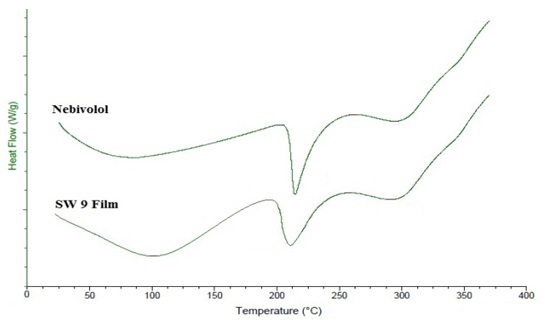 In DSC of the formulation, broaden the endothermic peak of 225 ºC was found to be shifted left at 3 ºC. The DSC results revealed that no interaction between the drug and the used polymers occurred as there was only shift, no specific change in the melting endothermic peak. Thermograms of the nebivolol HCl and Optimized Batch (SW9) are shown in the Fig. 11. Stability Studies: For stability study, formulation batch SW9 was kept for 30-90 days in stability chamber and samples were taken after 30 days and 90 days and analyzed for tensile strength, drug content and percent drug release after 40 min, which shows slight changes as shown in Table 6. The stability studies indicates that the formulation batch SW9 was stable for a period of 90 days at 40°C ± 5 °C and 75 % RH. CONCLUSION: The present work was successfully prepared fast dissolving mucoadhesive buccal film of nebivolol by using solvent casting method. These prepared fast dissolving mucoadhesive buccal film of nebivolol fulfills the need of present work with improve the bioavailability and therapeutic efficacy of drug; avoid first pass effect and side effects associated with high dose of drug. All the formulations possessed the good mucoadhesion, and they were free from irritation and released the drug completely by diffusion mechanism. Thus it can be concluded that the prepared formulation of buccal mucoadhesive film can be a novel treatment for heart diseases such as myocardial infraction and angina pectoris. ACKNOWLEDGEMENT: Anilkumar J. Shinde and other co-authors are wished to acknowledge East West Pharmaceuticals Pvt. Ltd. Haridwar, Uttrakhand, and Colorcon Asia Pvt. Ltd. Goa for providing Nebivolol and HPMC E15 as gift samples. Authors are also grateful to Dr. H. N. More, Principal Bharati Vidyapeeth College of Pharmacy, Kolhapur for providing excellent facility to carry out this work. CONFLICT OF INTERESTS: There are no conflicts of interest. Gandhi S, Pandya P, Umbarkar R and Shah M: Muco-adhesive drug delivery systems-an unusual maneuver for site specific drug delivery system, An International Journal of Pharmaceutical Sciences, 2011; 2: 133-134. Carvalho FC et al., Mucoadhesive drug delivery systems, British Journal of Pharmaceutical Sciences, 2010; 46: 4-5. Patil SA et al., Fast dissolving oral films: an innovative drug delivery system, International Journal of Research and Reviews in Pharmacy and Applied Science, 2012; 482-496. Kalyan S and Bansal M: Recent trends in the development of oral dissolving film, International Journal of Pharma-ceutical Technology, 2012; 4: 725-733. Siddiqui M, Garg G and Sharma P: A novel approach in oral fast dissolving drug delivery system and their patents, Advances in Biological Research, 2011; 5(6): 291-303. Satishbabu BK, et al., Preparation and evaluation of buccoadhesive film of atenolol. Indian Journal of Pharmaceutical Sciences, 2008; 209(2): 175-179. Doijad R, Manvi F, Malleswara V and Patel P: Bucco-adhesive drug delivery system of Isosorbide dinitrate: formulation and evaluation, Indian Journal of Pharma-ceutical Sciences, 2006; 68(6): 744-748. Hao J, et al., Buccal drug delivery system, Drug Development Industrial Pharmacy, 2003; 19(8): 821-32. Pavankumar G, Ramakrishna V and William G: For-mulation and evaluation of buccal films of salbutamol sulphate, Indian Journal of Pharmaceutical Sciences, 2005; 6(2): 160-164. Panigrahi L, Pattnaik S and Ghosal S: Design and characterization of mucoadhesive buccal patches of diclofenac sodium, Indian Journal of Pharmaceutical Sciences, 2005; 67(3): 319-335. Ramana N, Nagda C and Himaja M: Design and evaluation of mucoadhesive buccal drug delivery system containing metoprolol tartrate, Indian Journal of Pharma-ceutical Sciences, 2007; 69(4): 515-518. Singh S, Gangwar S, Garg G, Garg V and Sharma PK: Preparation and evaluation of buccal bioadhesive film containing clotrimazole, AAPS Pharmaceutical Science Technology, 2008; 9(2): 660-667. Semalty M, Semalty S and Kumar G: Formulation and characterization of mucoadhesive buccal film of glipizide, Indian Journal of Pharmaceutical Sciences, 2008; 70(1): 43-48. Yehia S, El-Gazayerly O and Basalious E: Fluconazole mucoadhesive buccal films: In-vitro/in-vitro performance, Current Drug Delivery, 2009; 6(1): 17-27. Ammar HO and Ghorab M: Polymeric matrix system for prolonged delivery of tramadol hydrochloride, part 2nd: biological evaluation, AAPS Pharmaceutical Science Technology 2009; 10(3): 1065-1070. 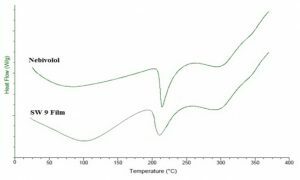 Paschal M, Patel H, Bagada A and Vadalla K: Formulation and evaluation of mouth dissolving film of ropinirole hydrochloride by using pullulan polymer, International Journal of Pharmaceutical Research and Sciences, 2012; 1: 60-72. Vijaya SK, et al., Montelukast sodium oral thin films: formulation and in-vitro evaluation, Asian Journal of Pharmaceutical and Clinical Research, 2012; 5: 266-270. 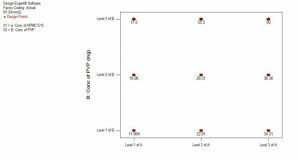 Shinkar D M, et al., UV Spectrophotometric method for the estimation of nebivolol HCl in bulk and pharma-ceutical formulations, Journal of Advanced Pharmacy Education and Research, 2013; 3(3): 244-247. Sonawane SH et al., Formulation and evaluation of famotidine fast dissolving oral film, World Journal of Pharmaceutical Research, 2012; 1: 1095-1084. Parejiya PB, et al., Quick dissolving films of nebivolol hydrochloride: formulation and optimization by a simplex lattice design, Journal of Pharmaceutical Investigation, 2013; 43: 343-351. 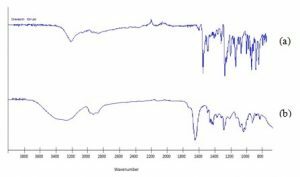 Mishra P, Shah K and Gupta A: Formulation and characterization of rapidly dissolving films of cetirizine hydrochloride using pullulan as a film forming agent, Indian Journal of Pharmaceutical Education and Research, 2011; 45: 71-77. Rao NGR and Suryakar VB: Design and development of mucoadhesive drug delivery system of montelukast sodium, International Journal of Research in Ayurveda and Pharmacy, 2011; 2(2): 491-497. Chaudhary A, et al., Designing and evaluation of mucoadhesive buccal films of propranolol hydrochloride, Journal of Advanced Pharmacy Education and Research, 2012; 2: 239-246. Bharathkumar V, et al., Formulation design, in-vitro evaluation and stability studies on mucoadhesive buccal films of anti-anginal calcium channel blocker, Journal of Applied Pharmaceutical Science, 2011; 1(6): 136-142. Rao NGR, et al., Formulation and in-vitro evaluation of mucoadhesive buccal patches containing zolmitriptan using gel forming polymers, Der Pharmacia Sinica, 2012; 3(1): 47-57. Heer D, et al., Development of fast dissolving oral films and tablets of cinnarizine: effect of super disintegrants, International Journal Pharmacy and Pharmaceutical Sciences, 2014; 6: 186-191. Shinde AJ, Waghmare DS, Dalvi RS and More HN: Formulation, design and characterization of mucoadhesive buccal film of nebivolol using factorial design. Int J Pharm Sci Res 2018; 9(5): 1797-05. doi: 10.13040/IJPSR.0975-8232.9(5).1797-05. Authors Address: Department of Pharmaceutics, Bharati Vidyapeeth College of Pharmacy, Kolhapur, Maharashtra, India.